Thanks to Caroline Benjamin of Food Allergy Aware for sharing this lovely little video with me. The link below should take you to Facebook and shows Greg at a cookery demonstration airing his very rude and ignorant attitude about people with allergies. Here is the post from the lady who had the unfortunate luck to be there in person listening to Greg that day. ‘Mr Masterchef’ Gregg Wallace at todays Dundee Flower and Food Festival. Very rude and discriminatory on his views towards allergies, this is not peoples choice. My son has CMPA And other allergies, you try living with it as a child and a parent! Then see what you think! 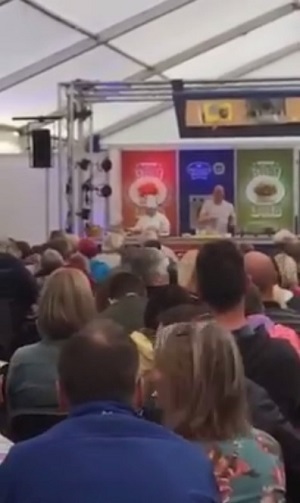 You can watch the video of Greg Wallace ranting about people with allergies here. “When people come into my restaurant and say, ‘I can’t eat this, can’t eat this, can’t eat that, can’t eat that. What are yo going to do about it?’ I would like to actually have legislation that if you’ve got an allergy to something, you have to give the chef 48 hours warning of what you can’t eat, the chef can then tell the person what they plan to cook for them and you can decide whether they want to eat it. She says no and he shouts. “Brilliant, off you go.” Then you can hear the crowd titter in amusement or discomfort, who knows. I wonder how many people in that room were seething hearing the way he spoke about this? When I first listened to it he was speaking so fast it sounded like an auction or something. Now I actually agree about giving warning to any restaurant. Not about having legislation, but that giving as much warning as possible is wise. I usually give as much warning as I can, sometimes a month, sometimes a fortnight and always always more than one warning. I always phone again a week before and email confirmation of what I can and can’t eat and turn up early so I can get the food conversation over hopefully before everyone turns up. I also agree that the chef is a great person to engage with about what is safe to eat. But the idea that I would phone the restaurant and then wait at home waiting to hear what I might have is just bizarre. But hearing Greg speak like this tells you that between the lines he doesn’t have much respect for people with allergies. Or am I being too sensitive? Having just come back Telford International Centre where the catering was outstanding I had been feeling really positive again about eating out. Attitudes are changing but to hear someone in the position Greg is in talking like this makes me seethe. Just so you know Greg Wallace. I have lots of allergies and unfortunately, no… I can’t eat that, can’t eat that, can’t eat that… blah blah blah. But don’t worry. I won’t be bothering to book a table at your restaurant any time soon because you’re rude and unkind. And for your information, I am so terrified of eating out that I rarely do. I am so frightened of trusting people with attitudes like yours. But when I do eat out I give way more than 48 hours notice and always take advice from staff. I don’t need you patronising me and others with allergies about how we should manage our condition. It is discriminatory and came across very unkind. Greg… are you listening? Have you ANY idea how embarrassing and humiliating it is just to have to go into a restaurant and tell them about your allergies. Have you? Because I am that person. If I eat any nuts, dairy or soya I will have anaphylaxis. If I eat wheat, celery, tomato, kidney beans or broad beans I will be ill, very ill, maybe for a few days, sometimes for a few weeks. It will cause a skin flare up, eczema all over my face, back, torso and neck. I won’t sleep because I will be in pain from such chronic bloating and stomach cramps. And Greg, another thing. There should be a law about being nasty and discriminatory about people with allergies. It is not lifestyle choice. We do not have any choice at all, we were just born like this. You are very lucky as I am assuming from your attitude that don’t have any allergies. So before you spout off about allergies again or roll your eyes or judge someone dining in your restaurant who has allergies, have some compassion and empathy. Most of us will always give you plenty of warning because we’re terrified of being ill but sometimes things happen last minute. Ever been compulsive? Ever just gone out for a meal at a moment’s notice? I’ll bet you have. Well that is not something those of us with serious allergies can ever really do, but if we don’t have time to give you much warning is it too much trouble to just get a plain steak? or something that doesn’t contain allergens? And not get your judgement, your sarcasm and your contempt? Luckily there are loads of restaurants who care about their customers and do not discriminate or judge their allergic diners. Always give plenty of notice if eating with life threatening allergies and coeliac disease but check out the FreeFrom Eating out Awards for ideas if you would like to find somewhere truly outstanding. It’s been a while since I had an allergy rant. That felt good. What have you got to say about that Greg? NB. best avoid Wallace & Co restaurant and Greg’s table in London. Not sure quite what welcome you’ll get.